Discussion in 'General Discussion' started by Casey Rudd, Jul 18, 2015. Hey guys! Hope you all are having a great start to the weekend. This week's contest was inspired by YOU. We absolutely love seeing our cards in photos and videos from all around the world. Just a few days ago we shared a piece of card art by none other than Instagram user @CardStories (Scott Dyer) using nothing but a single playing card. Truly remarkable work; definitely leaves us speechless! This week's contest is to create a piece of art out of a single playing card. You can draw on it, cut it, fold it, or anything else you can imagine. You can use theory11 cards or any other playing cards, it does not matter. The piece of art must be brand new and created for this contest (no old projects! ), and it must be original. You can head to Scott's Instagram page to see some amazing examples, but DO NOT take his ideas. Create your own art, in your own way. Post your entries to Instagram (tagged with #theory11) and then post the link below in response to THIS forum thread by no later than tomorrow, Sunday, July 19th at 7:30pm EST (24 hours!). The person who creates our favorite work of art will walk away with 1,000 Elite Points and 3 Decks of Mystery Box Playing Cards (first edition or black edition) shipped on the house, anywhere in the world! We are absolutely excited to see what you guys can come up with. Good luck! Hmmm...I wonder how well a picture of a single playing card, unaltered, would go down. After all the wonders and the possibilities of a playing card are what makes it beautiful, kind of like life, right...? Guys? I plan to submit something that I created awhile ago (yeah, I know you aren't supposed to use old projects) so I was planning to finish it (it's half completed). It may take close to 3 hours to complete the thing so I wanted to know if it's eligible for entry. 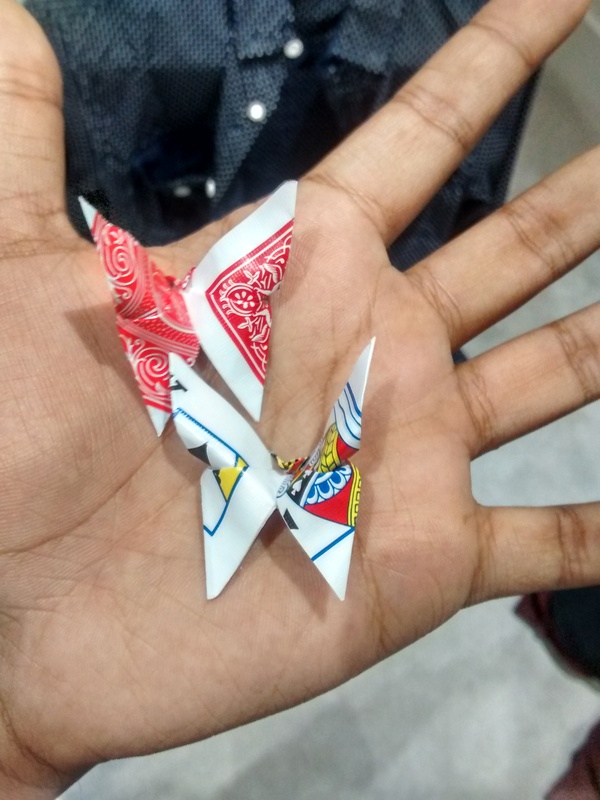 Origami butterfly out of a single King of Spades from a deck of red bikes. Well then, the pressure is on! And yes, blanks will make a showing. I have my idea and I'm sorting out the logistics. Logistics? If you fly to Paris, visit the Louvre, cut out a border from a playing card and then take a picture of the Mona Lisa through said border then you win, on grounds of commitment to the cause. Made with a single queen of hearts (and a red napkin for flair). I've made two of these now! Well I don't really think this counts (because it's technically an old work). I did spend ~6 hours total working on this. Here's my colored card submission of a Navy Blue Monarchs playing card. Colored in by hand on Adobe's Ideas app on the iPad. Can entries be posted in this thread? I don't see why not, they allow it for similar contests. "Post your entries to Instagram (tagged with #theory11) and then post the link below in response to THIS forum thread"
I saw that. However, it didn't say "post your entries to Instagram only." And like Bryant said, usually posting pictures here is okay. I take your response to mean that entries cannot be posted here? All right! I'm so confused. I'm afraid I might fall into the MADness! Every week I look forward to your entries! I had a similar idea, not the same but similar enough that I'm going to now go in a different direction. Here's my entry, pretty simple, but here it is!